Supplementary material reads: "Photographer: Mack. 1958-08-21. 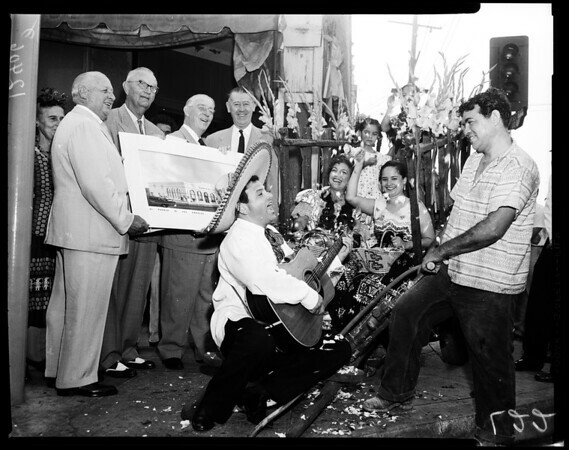 Assignment: Bank of America groundbreaking on Olvera Street. 17/18,21/22: L to R: Walter J. Braunschweiger, John A. Hennessey, Supervisor John Anson FOrd and City Council President John S. Gibson. Workman with air hammer is Joe Rodriguez, and guitar player is Lalo Robles. Girls in cart not identified."